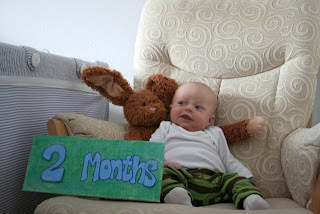 Mile High Baby: Peter Ambrose is 2 Months Old Today!! 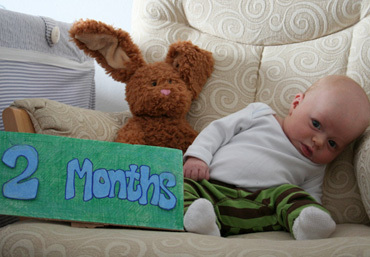 Peter Ambrose is 2 months old! •consistently cooing, babbling, squealing, etc. •has developed his social smile (vs. reflexive). •has found use for his legs - kicking! Peter Ambrose is more interactive in general. He LOVES being sung to, particularly when Mommy or Daddy move his arms and legs to the tune. Some of his favorites: "Itsy-bitsy Spider," "The Wheels on the Bus," and "Pat-a-cake." Everyone who has met him has remarked on how alert he is and observant of his surroundings. He really does not miss a thing! Update: Outtakes Gallery! Not all photos go according to plan, and we just uploaded about a dozen funny "mistakes."